[William Etter] and his classmates built a quadcopter as a class project. We love the details of these builds and they came through with some thorough documentation. Some highlights that we enjoyed were reading about ABS body design and construction, their analysis of two versus three blade propellers, and their breadboarded control mechanism. You can see their success in the most recent post, but we all know that trial and error plays a role in these builds so we’re glad they’ve shared a collection of crashes with us. Can’t get enough of this four-rotor action? Check out this project of a similar design. Somehow this “budget aircraft” blog appears to have zero info on build cost. I was reading through their write-up but didn’t understand something. What do they mean by PID? They refer to having to tune it fairly often. I’m wondering why they didn’t try it outside first (on the soft grass)? I guess they wanted a more stable wind-less environment? @andrew: PID stands for Proportional Intergral Derivative controller. Check out wikipedia for tons more info. So we’re in the process of typing up our final report which will include more detailed information about costs and suppliers for parts. We’ll include this information in a final blogpost on the project. 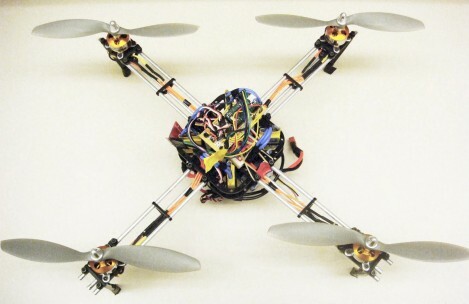 Also, since we have proven that we can make this fairly low cost with off-the-shelf parts, we are also exploring the possibility of redesigning the quadrotor with better and faster electronics, a more complete PID control system (to make it up to par with the current projects such as MikroKopter), and new airframe. The possibility of making this a kit that will allow people to have a stable platform for more advanced projects (or just strapping a camera to it and having fun!) is also being looked at. Thanks for the update. I’m looking forward to the air frame design. It looks like an nice stable starting point. I’ve been thinking of a heavy lift version to transport a life jacket and a “recovery” line past the ocean surf in a rescue situation. A 5 or 6 rotor would also provide redundancy. i and my team mates have decided to make a similar project for our engineering final year . It would be a great help if you could forward your study and experiences to us. Also the parts specifications and how you can reduce its overall cost.